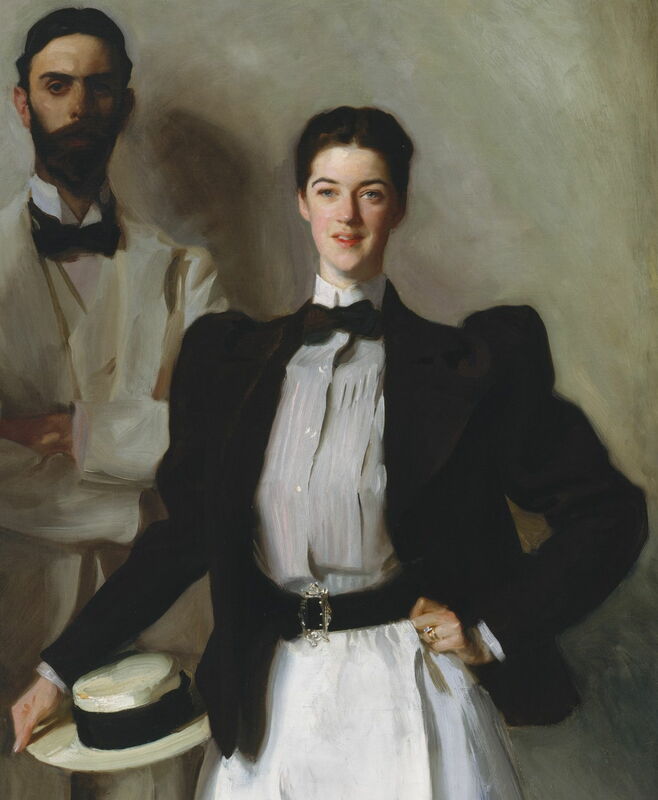 John Singer Sargent (1856–1925), Mr. and Mrs. I. N. Phelps Stokes (detail) (1897), oil on canvas, 214 x 101 cm, The Metropolitan Museum of Art (Bequest of Edith Minturn Phelps Stokes (Mrs. I. N.), 1938), New York, NY. Courtesy of The Metropolitan Museum of Art. Quotation, borrowing, reference, allusion: whatever you call it, a lot of paintings seem to include passages, elements or features which have previously appeared in other paintings. Although common, it is a difficult issue. What we might see as an obvious similarity between two paintings might never have occurred to the painter of the later work. Sometimes, this might happen by chance; more often, perhaps, both artists had a third source, which might have been a mental image rather than another painting. Bruce Redford’s new book John Singer Sargent and the Art of Allusion (Yale UP, ISBN 978 0 300 21930 2) is a fascinating exploration of many likely allusions in Sargent’s portraits, which reference great portraits and other works by masters such as van Dyck, who was a particular favourite of Sargent, as he was to other modern masters including William Merritt Chase. Professor Redford’s book is not one which you will be able to read straight through, I suspect. Approach it with a healthy scepticism and you will, at first, doubt some of the allusions which he claims. I have needed to go away, think about it, look again at its lovely illustrations a few more times, and re-read his highly accessible text. In the end, though, I think that his proposals not only work, but cast new light on Sargent as an artist, and his many portraits. There are, thankfully, a few occasions where sufficient evidence exists to convince even the most sceptical. This article looks at one example, described early in the book, and broadens its scope a little. In 1895, two notable young residents of New York City married. He was Isaac Newton Phelps Stokes (1867-1944), a recent graduate of Harvard who studied architecture for three years at the École des Beaux-Arts in Paris. He went on to co-found the architectural firm of Howells & Stokes, and was a pioneer in social housing. She was Edith Minturn (1867-1937), daughter of the shipping magnate Robert Bowne Minturn, Jr., and destined to become a philanthropist, socialite, and artistic muse. A close friend decided that a good wedding gift would be a portrait of Mrs Stokes painted by the greatest of the age, John Singer Sargent (1856–1925). For various reasons this was delayed, but in 1897 the artist and the couple got together and Sargent started work. As Sargent kept few written records, we rely on the account given by Mr Stokes in his memoirs, and quoted by Redford. Sargent’s original intention had been to paint Mrs Stokes wearing formal evening dress, sitting next to an Empire table. However, he changed his mind, and decided to paint her standing in informal walking attire next to a Great Dane. As he was making this reconception in his mind, Sargent turned to a portrait which had been donated to the Metropolitan Museum of Art by Sargent’s patron, Henry Marquand in 1889: that of James Stuart, by van Dyck. Anthony van Dyck (1599–1641), James Stuart (1612–1655), Duke of Richmond and Lennox (1633–35), oil on canvas, 215.9 x 127.6 cm, The Metropolitan Museum of Art (Marquand Collection, Gift of Henry G. Marquand, 1889), New York, NY. Courtesy of The Metropolitan Museum of Art. 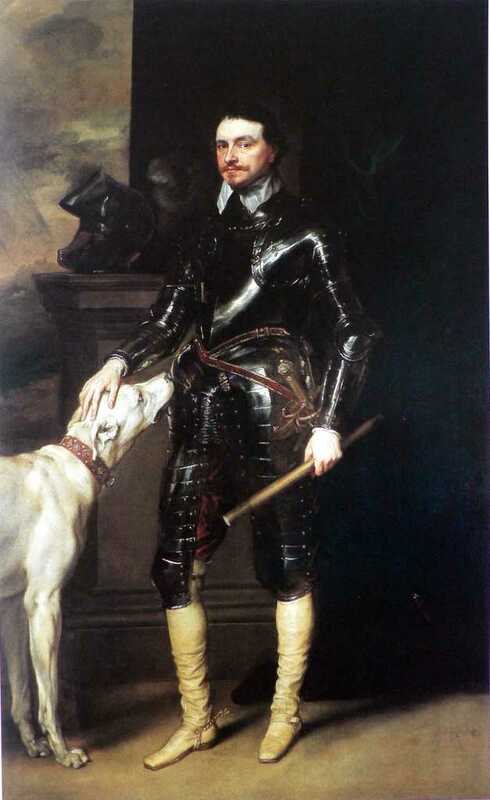 Van Dyck’s portrait puts James Stuart (1612–1655), Duke of Richmond and Lennox (1633–35) at a slight angle, his left shoulder forward, and his left hand on his hip in ‘Renaissance elbow’ position, to show off the silver star worn as a member of the Order of the Garter (itself just visible belowhis left knee). His right hand then strokes the Great Dane’s head. Unfortunately, Sargent was unable to find a suitable dog. Mr Stokes then “offered to assume the role of the Great Dane in the picture”, as he put it. Sargent therefore painted Mrs Stokes in essentially the same pose as that of van Dyck’s James Stuart, maintaining the line of her right arm to hold a straw boater against her hip. She is the subject of the portrait: bright, boldly lit, and looks directly at the viewer with a smile of confidence and a glint in her eyes. Anthony van Dyck (1599–1641), Thomas Wentworth, later 1st Earl of Strafford (c 1639), oil, dimensions not known, Private collection. Wikimedia Commons. 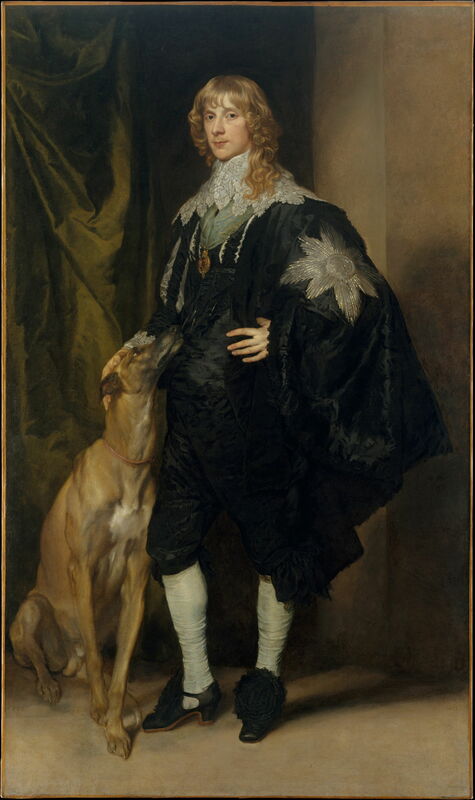 This was not van Dyck’s only portrait in which he posed a man next to a large dog: his Thomas Wentworth, later 1st Earl of Strafford (c 1639) borrows again from the earlier portrait of James Stuart. There are many other portraits of notable men alongside their dogs too. Most involve rather different poses, often with smaller sporting dogs, the man usually holding a hunting gun. Artist of Flemish School, Portrait of Charles-Alexandre de Croÿ, Marquis d’Havré and Duc de Croÿ (1581-1624) (c 1610), oil on canvas, 195 × 109 cm, Private collection. Wikimedia Commons. This Flemish School Portrait of Charles-Alexandre de Croÿ, Marquis d’Havré and Duc de Croÿ (c 1610) is rather earlier and slightly different again, but the dog still evokes the common concepts of fidelity, nobility, and status. 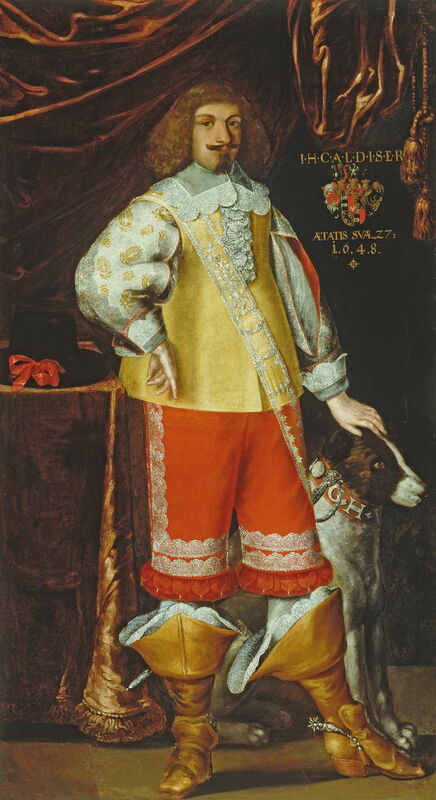 Artist not known, John George, Count Lamberg (1648), oil on canvas, 209 × 117.5 cm, Narodna galerija Slovenije, Ljubljana, Slovenia. Wikimedia Commons. 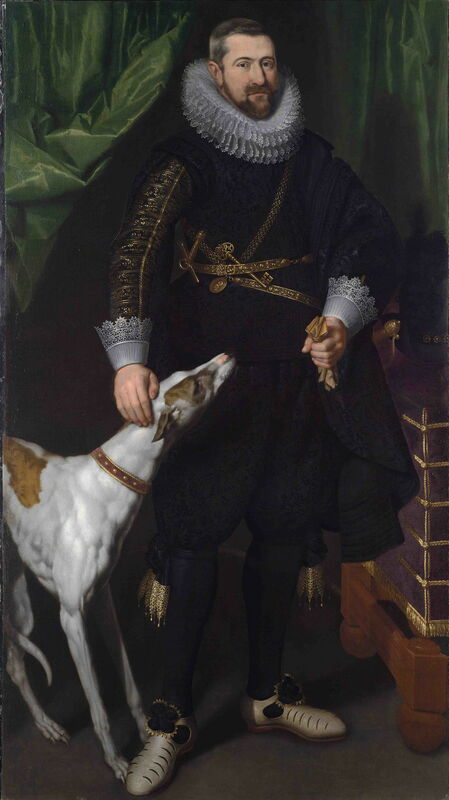 The combination of the dog on one side, and the ‘Renaissance elbow’ on the other is quite popular, as seen in this portrait of John George, Count Lamberg (1648), by an unknown artist. Rembrandt Harmenszoon van Rijn (1606-1669), Self-portrait in Oriental Attire with Poodle (1631-33), oil on oak panel, 55.5 x 52 cm, Petit Palais, Paris. Wikimedia Commons. 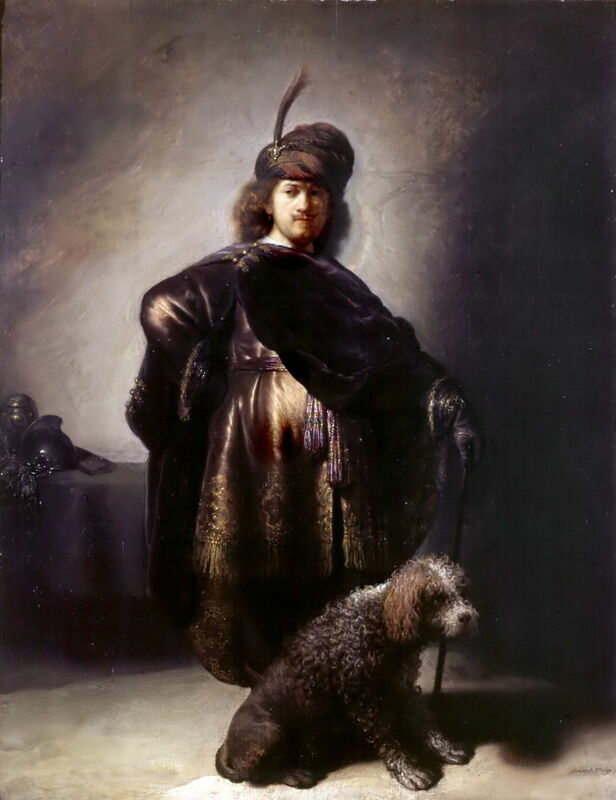 Rembrandt also got into fancy dress, parked a large poodle by his stick, and put his hand on his hip, in his Self-portrait in Oriental Attire with Poodle (1631-33). 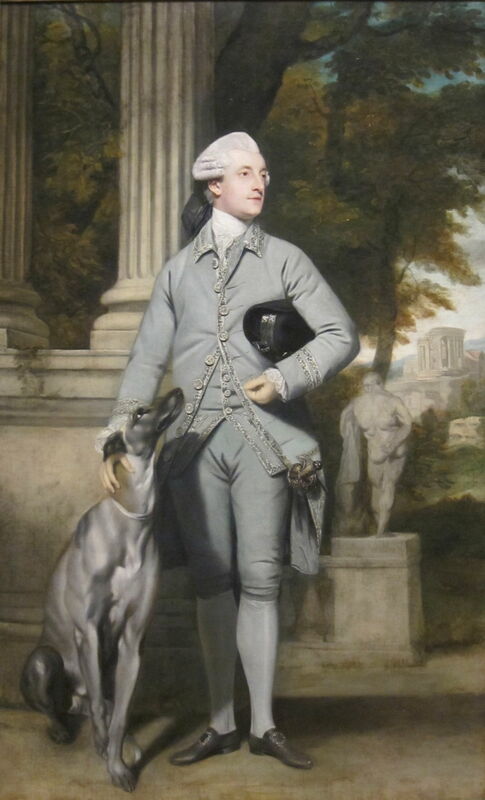 Joshua Reynolds (1723–1792), Richard Peers Symons, MP (later Baronet) (1770-71), oil, dimensions not known, Cincinnati Art Museum, Cincinnati, OH. Wikimedia Commons. Sir Joshua Reynolds seems to have favoured the pose for Richard Peers Symons, MP (later Baronet) (1770-71), here using his hat as an excuse for his ‘Renaissance elbow’. Neither was this pose confined to men. Admittedly most women – even those in the highest of places – were decorated with small, often belittling, lapdogs, but there were some notable exceptions. Alonso Sánchez Coello (1532–1588), Dona Juana (1535-1573), Princess of Portugal (1557), oil on canvas, 180 × 112 cm, Kunsthistorisches Museum, Vienna, Austria. Wikimedia Commons. Alonso Sánchez Coello’s portrait of Joanna of Austria, Dona Juana (1535-1573), Princess of Portugal (1557) shows the mother of Sebastian of Portugal who later became regent of Spain for her brother, Philip II of Spain. She may not wear a crown herself, but her dog’s collar appears very regal. 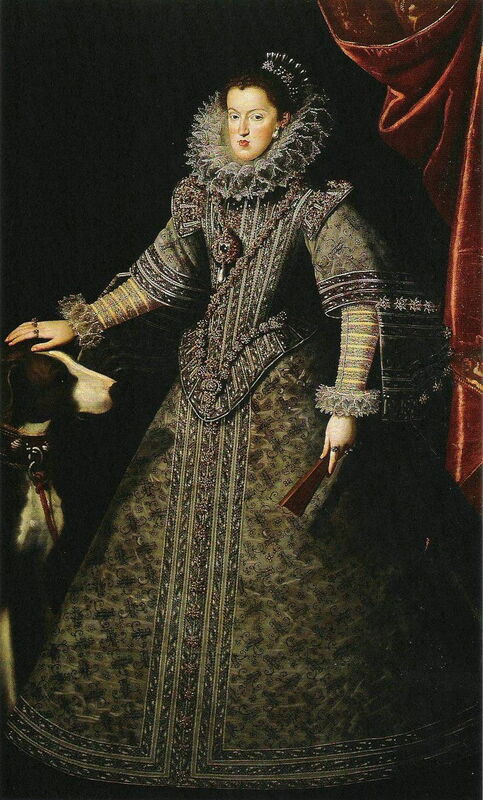 Bartolomé González y Serrano (1564–1627), Portrait of Margaret of Austria, Queen of Spain (1584-1611) (1609), oil on canvas, 116 × 100 cm, Museo Nacional del Prado, Madrid. Wikimedia Commons. There are also two very similar portraits of Margaret of Austria, that above by Bartolomé González y Serrano in 1609, and that below by Juan Van Der Hamen. Her left hand does not need to be on her hip, as she already has assumed a ‘Renaissance elbow’ by holding that hand so far clear of her voluminous dress. 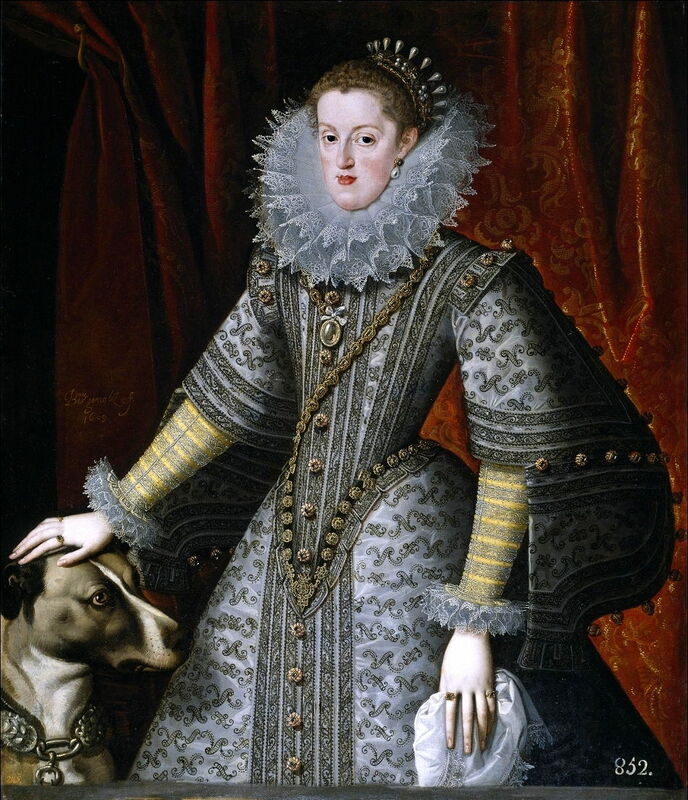 Juan Van Der Hamen (1596–1631) (attr), Margaret of Austria (c 1610), oil on canvas, 198 x 117 cm, Instituto Valencia de Don Juan, Madrid. Wikimedia Commons. Howard Chandler Christy (1873–1952), Official Portrait of First Lady Grace Coolidge (1879-1957) (1924), oil, dimensions not known, The White House, Washington, DC. Wikimedia Commons. But for me, the most fascinating of all these paintings is the official portrait of First Lady Grace Coolidge, painted by Howard Chandler Christy in 1924, the year that her younger son Calvin died. When she was First Lady, she was a very popular hostess, but avoided any involvement in politics. I just wonder whether Christy had seen van Dyck’s portrait of James Stuart in the Met, or Sargent’s double portrait of Mr and Mrs Stokes. The latter did not go into the Met until 1938, the year after the death of Mrs Stokes, though. Posted in General, Painting and tagged allusion, painting, portrait, Rembrandt, Reynolds, Sargent, van Dyck. Bookmark the permalink.